This entry was posted in Balance, Illustrations, Nature Art and tagged Art, autumn, balance, Children's Books, Drawing, fall, salmon, Turkey Vultures, Watercolor by MaryALivingston. Bookmark the permalink. These vultures are beautifully ugly. Great painting! Thank you. They are a welcome sight. Thank you. They are very happy at the moment. Our fall salmon run is in full swing and the turkey vultures are out in force cleaning up the shores. Keeps us happy, too! PS: Nice to meet you and your work, and thank you for your visit & follow! What a beautiful painting! While Turkey Vultures themselves will never win an award for beauty, they are highly beneficial in that they eat dead things…even diseased dead things. And they are so magnificent when they just soar across the sky. It’s nice to meet someone else who appreciates them! Thank you. They are such fascinating and interesting birds, but not well understood. I agree! And in case you are interested I have a similar (though shorter) sentiment with a picture of one of these magnificent birds at: http://opreach.org/2012/10/11/lets-just-pay-attention/. This is a great painting! Watercolor? They are characters. I have met a few living in rescue situations, they have interesting personalities. Oh, a kindred spirit! I love vultures! They are my favorite birds. They are gentle creatures, and so wonderfully graceful when they fly. They are Nature’s humble housecleaners. I was also told once that in Central American legend, the vulture is responsible for carrying the souls of the dead to Heaven. I have been stalking roadkill for over a year to study them as research for a children’s picture book. They are remarkable even if unappreciated. These are absolutely wonderful! You make them look like charming and proud creatures. 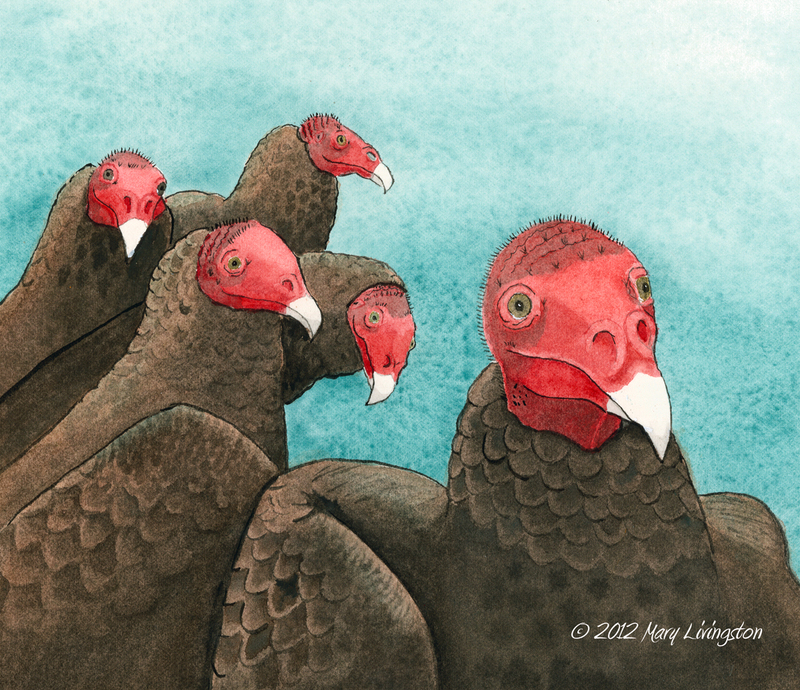 As I wrote on my blog for Thanksgiving, we should be grateful for Turkey Vultures as they do the world a great service. Just saw some of these cuties on your blog, what a fun Thanksgiving Day post. http://lindamartinandersen.wordpress.com/. I love the way you see beauty in all of nature. You are a ray of sunshine. I also gave the award to Tim. You two make a great pair!